I recently discovered a very neat program that we’ve begun using on one of my hobby sites. IMANDIX Cover Pro automatically converts any image into a 3D preview of what it would look like as the cover of a CD or DVD case. Our Web site is devoted to compiling feature-packed collections of various free software for the Sega Dreamcast. We generally like to provide cover artwork to go along with the disc images. 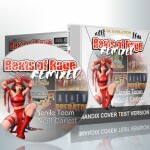 We now use IMANDIX Cover Pro to show our users exactly what the CD cases would look like if they were to download the cover art and print it themselves. I could easily see musical artists using this program to generate 3D images of their CDs, and I could also see software developers using these features in place of the standard “fake box” that a lot of developers have been creating. You can download the full-featured trial version (which places the watermark you see in the example above on all of your creations) from the IMANDIX Web site. Really glad to know about IMANDIX Cover Pro and its power to convert any image into a 3D preview of what it would resemble a CV cover or DVD case. Thanks for allowing us to dowload the full-featured trial version from your website.